The SEC arguably boosted its stock the most during the 2017 NCAA Tournament with three teams reaching the Elite Eight. This trend continued in the 2018 season as an Auburn program riddled in scandal claimed a share of the SEC regular season title for the first time since 1999. A Kentucky team that reeled in six five-star recruits only finished fourth in league standings. This shows how deep this conference is and how unforgiving the schedule and competition can be. Which team will scratch and claw their way to the top? Let’s dive in and find out. This SEC season was defined by Auburn and Tennessee. The Tigers jumped out to a blazing 10-1 conference record before cooling down substantially. Bryce Brown and his streaky jump shot led the way all season for Auburn. The Vols settled down after a rocky start to conference play and have won four straight entering the SEC Tournament. The SEC preseason media poll projected Tennessee to finish in 13th out of 14 teams. Florida and Kentucky, the two favorites heading into the season, endured a season maligned by inconsistencies. Florida’s offense appeared unstoppable when its three point shooting was on point, but lost and confused when it was not. Kentucky, a preseason season national title favorite, never seemed to fully come together as so many John Calipari coached teams do down the stretch of the season. Missouri’s conference championship hopes were dashed when top-three recruit Michael Porter Jr. went down in the first game of the season with a back injury. However, Missouri still battled its way to a fifth place finish. Alabama drew preseason intrigue due to the presence of flashy, confident freshman Collin Sexton. Sexton, along with freshman John Petty, could not vault the Crimson Tide into serious contention at any point during the season. Admiral Schofield led Tennessee to a share of the SEC regular season title (Wade Payne/Associated Press). Auburn dominated the SEC for about three quarters of the season. Coach Bruce Pearl’s blistering and relentless attack often left opponents dazed and confused. Pearl encouraged aggressively pushing the ball on offense, often seeking an early three point shot attempt in transition. Bryce Brown spearheaded the Tigers’s attack, averaging 16.4 points on 41 percent shooting. Mustapha Heron added 16.6 points and 5.5 rebounds per game for the Tigers. Heron’s ability to create plays off the dribble helped create space for Auburn’s shooters on the wings. Tennessee was led by the two-headed of Admiral Schofield and Grant Williams all season long. Schfield averaged 13.5 points and 6.1 rebounds while Williams added 15.6 points and 5.8 rebounds. Tennessee, winners of four straight to end the season, will look to continue to build off of that momentum in the SEC Tournament. Schofield, in particular, has been hot, pouring in 25, 24, and 23 points respectively in each of his last three games. Daryl Macon has Arkansas primed to shock the SEC world (Bob Donnan/USA TODAY Sports). Many pundits are clamoring about how the possible return of Michael Porter Jr. will magically vault Missouri into a dangerous darkhorse role both in this tournament and the NCAA Tournament. However, there is not guarentee Porter will play this tournament, and if he does, no one knows how effective he will be. Porter is returning from back surgery and will most likely struggle in his first few games back. 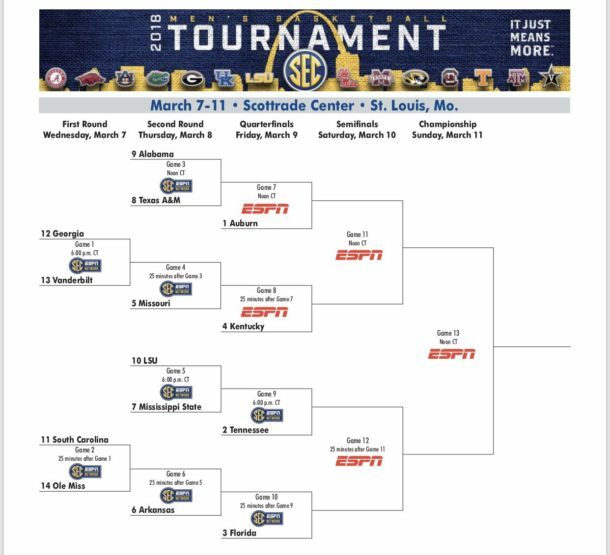 Meanwhile, the Razorbacks are seemingly rounding into shape as the SEC Tournament begins. Arkansas will enter the tournament winners of six of their past eight games. Led by two dynamic scorers in Jaylen Barford and Daryl Macon, the Razorbacks are capable of shooting any opponent out of the gym. Both Macon and Barford each average over 17 points per game and shoot 43.8 and 43.4 percent from three-point range as well. Arkansas, as a team, shoots at a 48.1 percent from the field and 40.2 percent from three. Arkansas can be derailed by poor free throw shooting. As a team, the Razorbacks only shoot 67 percent from the pinstripe. Poor fundamentals such as missing free throws can lead to blown late leads and disappointing exits in single-elimination tournaments. Bryce Brown is capable of shooting Auburn to an SEC Tournament title (Adam Sparks/Scout.com). Auburn seemingly found its offensive legs once again in its much-needed 79-70 victory over South Carolina. Down by eight points early in the match, Bryce Brown awoke out of hibernation to score 29 points on 60 percent shooting. Brown’s primary offensive game stems from his ability to hit open three pointers in transition. Brown could not buy a bucket during Auburn’s brutal stretch of losing three of four before defeating South Carolina. In its first game, Auburn will take on either Texas A&M or Alabama. A&M defeated Alabama in its final game to end the season. Even though both of these teams found a way to take down Auburn during the regular season, Auburn’s offense is clicking at the right time and this should be enough to outlast any push from these teams. Auburn would then take on Kentucky and then Tennessee in the final. If Auburn’s shooting begins to falter, a team like the Vols could take advantage by controlling the pace of play and pounding the rock inside. Look for Brown and Heron to take over in this tournament on the offensive end and lead Auburn to a title. You can “Like” The Game Haus on Facebook and “Follow” us on Twitter for more sports and esports articles from other great TGH writers along with Dan!